Named for its mating call — a clear bob-bob-WHITE whistle — the bird celebrated by Kevin’s Annual Southern Game Fair is small and plump, with mottled brown and white feathers and a short, curved bill. To be sure, vast segments of the American populace have no idea what a quail looks like, have not heard the sudden burst of its wings on takeoff and have never passed bits of its meat between their lips. But in Thomasville, Georgia, on a chilly Friday morning in mid-November, more than 250 people have gathered at Greenwood Plantation, most in the waxed jackets and quilted vests that signify someone who hunts quail or is quail-hunting adjacent. Some have enthusiastically lined up a range to shoot clay pigeons. Others cluster around fly-fishing presentations, bird dog demonstrations, or metal firepits where chefs have prepared tasting portions of sous vide quail and quail dumplings. From beneath woolly manes, two husky Clydesdales pull a wooden wagon loaded with children, and people in pairs and foursomes climb aboard helicopters to see the whole of Greenwood, one of the most private places in the world. 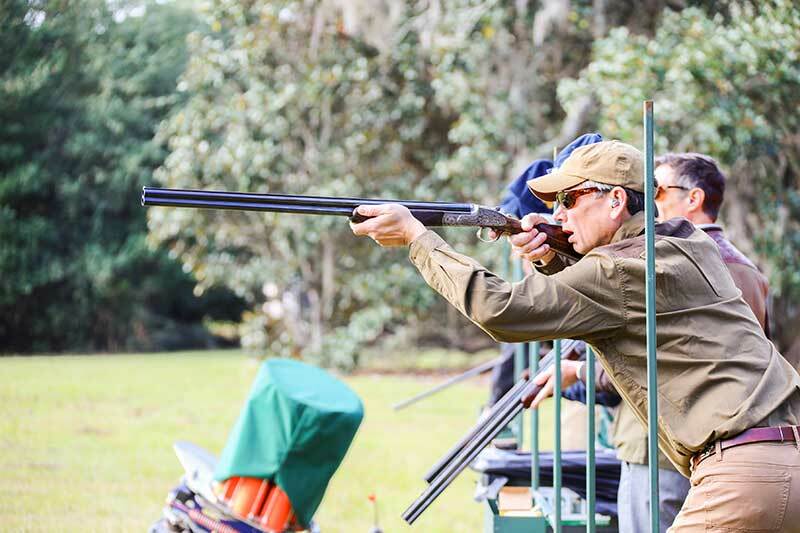 All have come to practice what is called the “upland lifestyle,” which revolves around hunts in South Carolina’s low country and the Texas Hills, at the foothills of the Rockies and here, on the most private quail plantations in South Georgia. That was Kevin Kelly’s pledge on the night before the game fair to an audience gathered on the second floor of Kevin’s Fine Outdoor Gear and Apparel in Thomasville, its walls hung with trophy mounts and paintings that celebrate English manor life. A subset of those attending the game fair had turned up for cocktails and passed appetizers. Kelly and his wife, Kathleen, also hoped they would bid on auction items. The Kellys had designated Tall Timbers, a timber and quail management organization for the Red Hills, as beneficiary of the door; auction proceeds would go to the NRA Youth Initiative, Tall Timbers and the Navy SEAL Foundation. Just outside a narrow gunroom stocked with bespoke firearms hung a poster-sized drawing of Thomasville, a patchwork map of plantations well known to most in attendance. Through LandLeader, Jon Kohler & Associates sponsored the cocktail party, along with Southwest Georgia Farm Credit, whose representative, Liz Nogowski, said she was grateful for the benefitting organizations’ service to the community as well as conservation and land management. Southwest Georgia Farm Credit also made a donation to Tall Timbers and the NRA Youth Initiative. Easily recognized by his characteristic cowboy hat, Kohler is part of what he calls “the industry built upon the stewardship of these lands.” His firm specializes in sales of plantations and ranches, including the Thomasville/Tallahassee and Albany markets, and the Alabama plantation belt. Many plantations have been in the same families for decades, he said; one recently sold in South Carolina for the first time in 300 years. “These are great places to preserve wealth. In the last recession, not one of these plantations went up for sale. All of them held,” Kohler smiled. Thomasville expanded after the Civil War as a fresh-air resort for industrialists seeking to escape the pollution of Northern cities. “The Northerners that came down here created the Southern sport of quail hunting,” Kohler explained. People encountered in the context of the game fair tended to use “hunting” and “conservation” interchangeably. As if to underline his point, English cockers and Labradors lay on the floor, their glossy coats occasionally petted by ladies in sheer, breezy blouses and slacks, and gentlemen in jeans and blazers. The auction went later than expected, as almost all charity auctions do. Items up for bid included High Adventure Company hunt packages in South Dakota (pheasant) or Patagonia (quail) and an Argentine mixed-bag hunt offered by Exciting Outdoors Argentina. Kevin and Kathleen each wore tailored clothing patterned with ducks to advertise a custom jacket offered by Kirpalani’s Tailors. John Burrell, president of High Adventure Company, based in Atlanta, volunteered two auction items. “This is our client base — most of these folks are our clients. They come to expect a certain standard. It’s not just the experience of the hunt that people are looking for. It’s attention to food and service. We are like hotels with a world-class sporting experience,” he said. During the bidding, LeBlanc — best known as a former vice chairman of the board of the New Orleans Saints — stood on stage, her dark hair tucked into a khaki fedora, a woven tartan inspired by the Navy SEALs draped over one arm: blue to represent the ocean, red for blood, and gold accents for the sand onshore. LeBlanc planned to accompany the top bidders on the Shirley Ranch hunt along with Brian Robinson, a decorated Navy SEAL reserve officer. Guests gathered at long tables set among shade trees for an al fresco lunch and auction. For most of the 20th century, ambassador to the United Kingdom and New York Herald Tribune publisher, financier and philanthropist John Hay Whitney owned Greenwood Plantation. Among his celebrated guests, President Eisenhower visited to hunt quail and turkey, and the duke and duchess of Windsor sipped tea at Greenwood. Jacqueline Kennedy twice found refuge with the Whitneys, most famously in February 1964. Greenwood today encompasses 4,200-plus acres purchased in 2015 by Emily Vanderbilt Wade, who also owns nearby Arcadia. A private firm owns the “campus,” with its 40-odd buildings, including the main house, damaged by fire in 1993. This year’s game fair was their second annual event. Caleb and Faris Connor and their four children, ages 3 to 9, had traveled to Thomasville from their home in Aiken, South Carolina. The children waited in child-size Barbour jackets to climb aboard the Clydesdale wagon. A lawyer, Caleb Connor was raised on a horse farm in Tallahassee. He had returned to town for a christening, extending the family trip for the game fair and to pick up a new dog, an English cocker. The Connors own a farm in Edgefield, South Carolina, whose rolling red clay hills remind Caleb of home, he said. “It’s an old cattle farm, and I’ve been trying to manage it for bobwhites. I let the fields grow up, applied fire. I’d seen two quail, heard them whistling, and so I knew there were more.” Connor explained that prescribed burning helps preserve the “early secession environment” favored by quail. C. Martin Wood III followed Palmer with a short presentation of several hounds. Wood is well known as a huntsman, and formerly served in an executive capacity at Flowers Foods, the billion-dollar packaged food company in Thomasville. “There are hieroglyphs in the pyramids showing hunters with jackals,” he told the crowd enjoying pork and pasta salad and camouflage-patterned Blue Bell ice cream. Attendants in brass-buttoned red coats and riding hats showed off a powerful hunting hound whose lineage, Wood said, could be traced to 1746. “The first real hounds came to England with William the Conqueror,” Wood said. “Modern fox hunting really started with the Enclosure Act,” referring to Acts of Parliament that created legal property rights in England for land that had previously been shared. The auctioneer announced the items and bids from the night before, with the addition of a new prize for auction: a tour of the Long Room in James Purdey & Sons’ London showroom and shooting at the West London Shooting Range. “Every crown head since Victoria has toured the Long Room,” Purdey’s representative Stephen Murray explained, adding that it was also the place where Eisenhower reportedly planned the D-Day invasion. The lunchtime bidding opened; by its close, in total, Kevin’s Annual Southern Game Fair had raised close to $60,000 for its charity beneficiaries. At the cocktail party, Kevin had promised his guests a feeling of old-time America. Based on the vision of the Northern industrialists’ grandchildren and great-grandchildren, plantation life in Thomasville — experienced as a series of game-bird hunts, single malts and tablecloth luncheons — has more in common with the bygone Edwardian country houses of England than the cash-crop farms of the Deep South. This version of Georgia looks a good bit like a shire county, when all of its small fields and hedgerows are devoted to bobwhite quail. Scenes from the Game Fair include meals featuring everyone’s favorite game bird, prepared by chefs from Longpine, Pinckney Hill and Loveridge plantations. A walking embodiment of the interdependence of hunting and conservation, Daphne Flowers Wood serves as chairman of the Tall Timbers Easement Committee and breeds foxhounds in Monticello with her husband. The first female president of the Masters of Foxhounds Association of North America called Thomasville “overdue” for an event like the game fair: “There are plenty of events in England that showcase rural recreational land use,” she said, adding that, in England, they also would feature falconry. “Open space and rural habitat is important for all kinds of creatures,” she continued, pointing out the recent discovery of a rare species of striped newt on Dixie Plantation. The luncheon tables beginning to empty, Wood credited hunting with saving some 80 threatened or endangered species. Wood looked around her surroundings. Kevin’s Annual Southern Game Fair had neared its end. Kevin’s Annual Southern Game Fair for 2018 will take place on Nov. 9. To be notified when tickets go on sale, join the mailing list at kevinscatalog.com or follow Kevin’s on Facebook and Instagram.